Welcome to The Seamaster Club message forum. I am looking to get new double glazed hinged windows for my Seamaster 820. Marine window makers are massively expensive. Any ideas? I am looking for a replacment push button for a Morris control in neutral. I was told about the toothpaste screw top but I would rather get a replacement if posable. Anyone know where might sell them ? I am looking for two Vents square plastic, they are pushed up from the inside. Also looking for hard wood tong and groove for the ceiling if anyone can point me in the rite direction. Also Seamaster did a manual blidge pump made from 314 or something like it.... would really one of those again. Does anyone know anything about the keel bolts on a seamaster 815? Having bought a Seamaster 815 last year, when I hauled her out for the winter I noticed a small dribble of rust from the hull/keel join. As the heads of the bolts are encapsulated in fibreglass in the bilges they are not easy to remove & check. Does anyone have experience of checking these bolts? Could anyone point me in the rite direction ?? Does anybody else havo a Seamaster27 with flybridge? I have bought a Seamaster sailer 815 with an old Yanmar YSE8 inboard diesel. The switch panel has 3 indicator lights for oil, water & charge. Both the oil and charge lights come on when I switch the ignition on, but the water does not. Does anyone know whether I should expect to see this lit as well when I switch the ignition on? We would like to replace both captain seats and the back bench seat with new faux leather seats . Does anyone know where we can purchase these. We looked into re-upholstering the existing ones but it cost more than purchasing new ones. We hope to get these sorted before the boat goes back in the water after Easter. We have a Seamaster 820. Thanks fir any advice. We are new to boating and cant wait for the new season to start. Can anyone tell me the front window size on a 813. From wat I can guess they look about 800 X 900 . I am 4 hours away from Norfolk where the boat is so can't measure. Does anyone know where I can purchase a replacement bell housing for a Seamaster 813 Wortham Blake 1.5 Fisherboy diesel engine ? One of the engine mounts is significantly cracked and it appears to be cast as part of the bell housing. looking for a rudder for a seamaster 20. Just picked up a seamster 28'. Needs new dashboard. Where should I start to look? I am considering purchasing a seamster 30 aft cabin, single Ford transit diesel. Can anyone tell me the 'classification' of these vessels for coastal or cross channel sailing? Does anyone have any info on where I could find a show control valve for a seamaster 813. the valve has been taken off due to a leak. the valve takes the water from the sink to the showerhead. 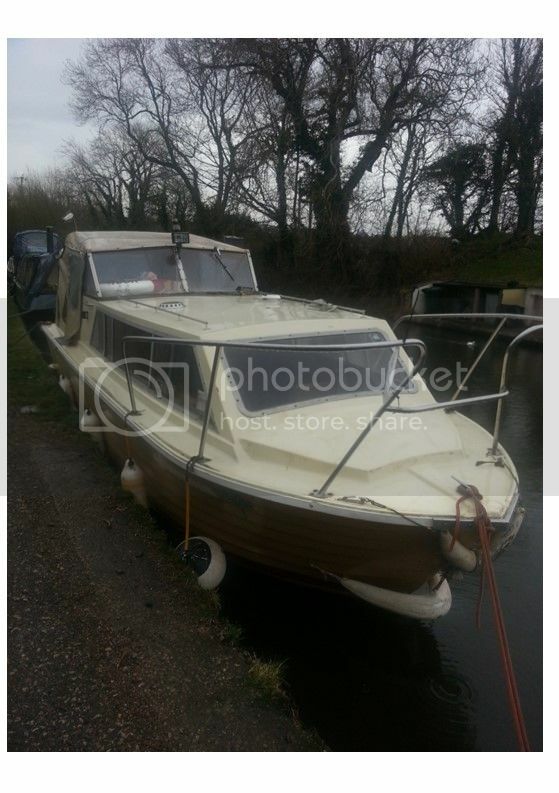 I am the current owner of the Edenleigh a 1967 Andrews 34 due to family circumstances the boat has been left for over 12 months now and although i wish i had time in my life to take this on as a project it just can't be. The boat is currently moored in the North East of England and I'm interested in hearing from anyone interested in offering a sensible price for this rare boat, outfitted beautifully in teak and mahogany other than soft furniture all original specification. hi im hoping to join the club this year anyway i have just taken ownership of a very neglected commodore 28 that has sat around since 2006 not used she has twin bmc 2.2 diesels fitted im wondering on her weight ?? is it 3.5tons or more ??? also what anodes should be fitted ie to rudders , shafts,?? any were else and does anyone know if it will help having trim tabs fitted as when open her up she lifts well up at the bow?? Im sailing a seamaster 27 with 2x60 hp Lombardini engines , in Danish waters where we can have rough wawes. Im thinking to make the midt wood keel about 7 inch deeper (20cm) in hope too stabilice the boat in rough sea??? Hi, we need to replace to top fold down window of our Seamaster 27 which was damaged in a storm. Can anyone recommend a manufacturer or dealer who could help? We are in the Cambridge area. Hi, We have just refurbished, here on the Thames, a 1970's Andrews with a Seamaster 34 hull. There were 4/5 made - does anyone have any news on the whereabouts of the others?? Help!I moved my boat out of its winter berth yesterday to find it wouldn't steer. The ruder has snapped of beneath the lower hinge. Does anyone have a spare the I can buy? Its great to see there is a members club for these boats. Im trying to help my friend and his dad get his seamaster 27 running well again. The engine hadnt been started for over 2 years, it started nicely but it seems to be running far too hot and cant see any water coming out the back of the boat as it should. Have stipped all the coolent pipes down to look for blockages I have removed the thermostat, still nothing. Could it be the water pump gone? How do i get the water to run out the back? Just getting exhaust gases so far. Does anyone have any suggestions on what i could try? I'm soon going to need to replace the canopy on my 23 cruiser & wondered if anyone had any recommendations for a supplier ? I have seen a few obviously fairly new canopies fitted to boats on my travels & quality & fit seem very variable. I can't seem to find anyone local (Norfolk/Cambridge) so it looks like it will have to be mail order & therefore no opportunity to see before I buy & potential difficulties if it's not up to scratch. I have recently purchased a Seamaster 34 and I am trying to find out some of its past. The hull number is 2274 built in 1968 with 2 BMC Commander 2.2 engines she is called STAR GLOW currently at Linton On ouse York But was moored at borougbridge marinia on the ouse from around 2000. Subject: seamaster 23 sailer lift keel drying ? I'm looking at Seamaster 23 sailers as my first sailing boat. I've seen only a couple of bilge keel versions but many more lifting keel . I now have a half tide mooring at Truro in Cornwall arranged. But would like to know if the lifting keel versions can dry out with out problems ? Also how do they sail ? Lifting keel v bilge keel ? Still very new to this . So any advise is gratefully received. I'm thinking you guys would be the best to answer these questions. Does anyone have a template for a front screen cover for a Seamaster27, or wish to sell one? I have recently purchased a 27 and the front windows leak like a seive, so I feel that the first step would be to fit covers. I can then work on the rest at my leisure. (plus the covers give added security and help cut down on the condensation in the front saloon). I have two of these engines, little used, they are currently in a stripped out hull. I think the boat was once a Seamaster Commodore but there is not much evidence left! I have a Seamaster 813 that needs the seals replacing in the side windows because they have perished and rotted away. Is this an easy job to do for a DIY or does it need to be done by a boat yard? Do the windows have to be removed and disassembled to replace the felt coated rubber strip? Any advice would be most welcome. We've just bought an 820 with a Thorneycroft 108 engine and I've been reading up on how to drain the system (prompted by the article in the current edition of the magazine!). 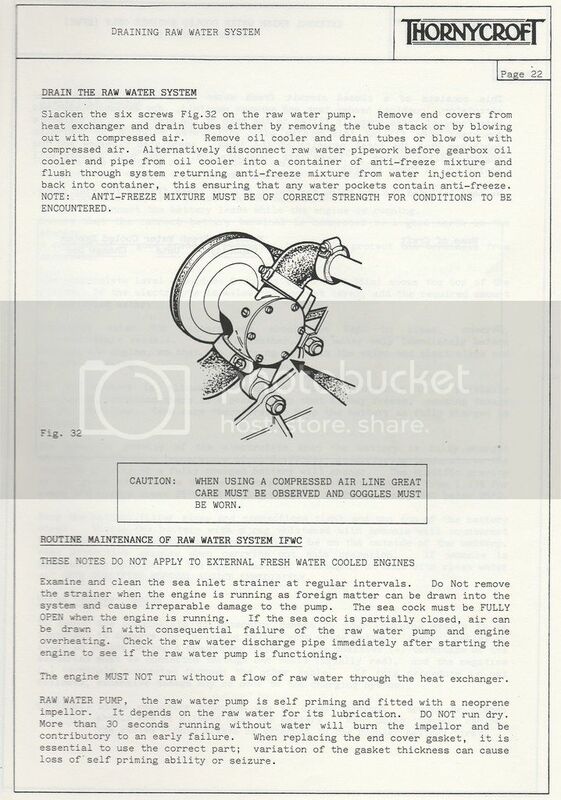 As I'm new to this engine I thought that the Thorneycroft Owners Manual would be the best bet but after reading the relevant section I'm confused. I read the sentence starting 'Alternatively' and can't follow it at all although I assume it's suggesting that purging the system with an anti-freeze mixture is the goal. Does anyone have a recommended method of draining or otherwise winterising the raw water system on this engine please? My Boat is fitted with a CAV Type No 448-2M fuse box that should contain a fuse between the alternator and the ammeter/battery. The fuse at some point has been replaced with a piece of copper wire! Anybody know what the correct type/rating of fuse should be fitted here? After a second hand foresail/genoa to fit my 23ft Seamaster. Roller-reefing type. Needs to be in working order, no damage or rips. Appreciate some feedback. I have been told my existing sail is un- repairable after snagging on spreader and large rip. I am just starting the process of purchasing a Seamaster 34 as a second boat and I was hoping to find people out there who had either had one or has any advice. The reason behind this is that the one I am going for needs work on it in terms of bringing the interior back up to standard whilst adding a touch of 2016 to her. She is going to be kept in Greenwich and has twin Perkins 6.354 normally aspirated engines on board. Plenty of grunt there and these have just been serviced. I would love to hear any stories or history you know or if anyone would be happy to share some pictures with me, it would make my life a lot easier. I keep her on a river and woukd like to be able to improve keeping her strieght , somebody did suggest there is a rudder available to be bolted onto the Z drive . Which would suit best etc , any help gratefully recieved !! I have just taken ownership of a Seamaster 27 and it is turning into a bit of a project! I have leaks in places I never knew I had places. My main concens are the front hatch/screen and the drop screens. My toilet compartment has mushroom fungus resulting from the seal on the screen leaking at the junction with the side screens. Water is running down the inside of the cockpit and getting under the wood trim. Does anyone know where I can get a suitable replacement seal? Also the front window seals-same question. Any advice gratefully received. Bit of a test message this one. Can anyone tell me whether this section is still managed. I have news to place but I get the impression that it will not make it! Having just acquired Seamaster Sailer 23 No.101, I find her to be in need of a new tiller. So that I can keep the faith, can anyone help me out with a blueprint/drawing and dimensions for the tiller please. Hi all, this has more than likely been asked before but, the rubber on my Seamaster 813 window seals are rotting and need to replaced on all sides but need to do this before winter sets in so, it is a priority any ideas where I can purchase please. Subject: Where can I buy Ford Anglia 105E pushrod? New member to the club and first post, so please bear with me. I recently bought a Seamaster 17 with a Ford Anglia 105e (pre cross flow) engine. The tappets were a bit noisy so I decided to adjust them. When I got inside I noticed the intake pushrod on the first cylinder completely bent out of shape and was not even opening the valve. I straightened as best I could for now but need to replace it before I cause serious damage. I've not been able to find anyone stocking these. Any pointers to where I might be able to source it would be great. I am refitting a Seamaster 27 built by Springfield. I would like to fit a silencer to the exhaust to try and quieten it down a bit. Can anyone recommend a silencer please. Should i go for a water lock type or straight muffler type ? Subject: Plumbing Pipework Size for Seamaster 30??? I'm really struggling with this one: I had just finished installing a holding tank, converting the toilet to electric and relining/refitting the heads compartment, when I was about to connect up the plumbing pipework. I thought it was 12mm copper and had purchased 12mm-15mm reducers, however the pipework won't fit. It seems like it must be an old imperial pipe of roughly 13mm - can anyone identify the size of the pipework used?? Subject: Seamaster Plumbing Pipework Size? Can anyone advise what size the plumping connections are, copper pipework appears to be 13mm o/d and I can't seem to find any fittings to connect to this? 12mm is too small, I'm assuming it is an old BSP, however the thread seem very close together on the fittings. We have a Seamaster 23 with the 1970's Ford 1600 Crossflow. The engine temperature switch connector has broken off so I am after a replacement switch. However I cannot locate one. The unit is marked SWN11, 200F and 363-F. SWN11 appears to be a Lucas number but is not recognised on Google. 200F I assume is the temperature setting. 363-F only shows up on a switch a Stewart Warner switch in the US (Part 83307) but the thread size appears to be wrong. Theirs is 1/2" NPT. The switch I have is a 3/4" thread. I have tried several of my local motor factors, the 'been in the business for years type' and they cannot match it to a current part number. Any guidance on a potential part number or method of finding one would be appreciated. Or do you have the same engine with a different part that would also suffice? Just bought a Seamaster 813 and the cows at Lechlade took a liking to the port side Seamaster 813 badge. Does anyone know where I can buy one or have one made ? I have tried ebay and numerous google searches. I need to replace part of the wooden bulkhead between the engine and the heads compartment of my Seamaster 30, would anyone know the thickness of the plywood used to form this bulkhead? I know its a bit of a long shot asking this question, but unfortunately I forgot to measure it last week and its about a 3.5hr round trip for me to check it out? I have just got a Seamaster cub 17 and need a gear cable do's anyone no where to get one or the make I also need a hood do's anyone no were I could get one made? My friend bought a 35 footer yacht registered as "Seamaster". Anybody knows Seamasters around 35 feet LOA? I m looking for a replacement or repair for my shaft coupling on our Seamaster 813 BMC engine with Hidrive gearbox. The existing is the 2/4 hole doughnut type with 4 rubber bushes. Can anyone advise on where Ican get it re - bushed or replaced please? Can anyone help with the tank capacity on a seamaster23 with a Perkins 4108 engine also how much fuel should it use on normal river or canal cruising. thanking you in advance for you help, Mick. Some 7 years ago a Seamaster 34 was advertised on the Thames at Chertsey Meads which interested me and went to see with an offer in mind,However she was sold the Sat pros to my visit and the seller accepted an offer exactly what I had in mind as he had moved to France,He used her as a live aboard and would have been ideal,It was not to be,She was a beautiful boat in the name of Arundella and I hope she is still being enjoyed as she was a lovely boat. I'm new to boating and have just purchased a Seamaster 30 Mkii, which only has sea toilets fitted. I need to fit a holding tank and was wondering if anyone could advise on best location, size of tank, etc etc. Something of a long shot but I am about to get a new mast foot for Sea Holly cast. If anyone wants a replacement or a spare for the future, please let me know asap. The cost should be well under �100. I am a former owner of an 813 (Jeaneil) & as a model maker would like to build a model of one. Are plans available anywhere which might help me? We have a SMC28 and have recently realised that our steering gear is in need of maintenance. Does anyone know where I can get a diagram showing the internals of the mechanism that connects the steering cables to the rudder through the hull? I'd like to see what is in there (and, perhaps, get some idea of material specifications), before taking anything apart. I am the proud owner of a Seamaster 23 cabin cruiser and it is my first boat . when we first got her the engine was unreliable to say the least and my first ever venture out resulted in a breakdown and a drift to the bank side and no ability to rectify it until a nice gent in a passing boat offered us a tow! as you can imagine that knocked our confidence and the wife refused to go on it again and the children were forbidden which was against all the reasons i bought the boat in the first place!! i have since fitted a new engine ( ford cross flow 1.6 petrol engine) and it appears to be a sound engine only the problem i have now is i have lost all my confidence and i find myself sitting on the pontoon with the engine running worrying about breaking down if i cast off!! such a shame. a friend has said i should by a tender as a back up so in the event that a breakdown i could at least get my family back to shore safely and also possibly have the ability to tow the boat back to the mooring. i have since purchased a 2.6m wet line inflatable dinghy with a Yamaha 2HP 2 stroke engine. i don't need to go fast or get on the plane as it is an emergency back up but people are telling me that it wont move against slight tides and definitely wont pull a 23 ft boat!! A few months ago i for filled a childhood dream after many years of of boating on the Norfolk broads brought my first boat, which I must confess was love at first sight (please don't tell the missus !!!). She was recently upholstered throughout with a new canopy! , how lucky am I I thought. I knew she was a seamaster but was not 100% sure as to which model she was, especially as she was listed as a seamaster 27!!! Another lesson learned. We left our 813 in the water this year - engine, water etc winterised + tubular heaters in engine bay so hopefully everything will be ok. Problem is water ingress via the canopy has done some significant damage to the varnish. We didn't use a tarpauline cover this year. The sides and helm contours of the 813 seem to encourage water ingress especially when rain driven. Anyone else had this experience? Looking for some advice, I have seen an ad for a seamaster sailer 23, looking for my first yacht on paper seems like a good boat which is in budget! Going to look at this boat in two days the ad says in has a semi long keel daft 3.9, but I havnt really been able to find any info on this keel model, wondering if you guys might give me some in site? Subject: Original stern navigation light for a Seamaster 23. I have just purchased a seamaster cub which still has its original glass front windscreen and was wondering was this screen from a car? and if so which model? If it was not from a car, does anyone know which windscreen they used originally? Thanks you very much, I would be grateful for a info anyone may have. We have a Seamaster 25 moored at Lechlade Marina that unfortunately has been damaged following a fire. Does anyone know who I could contact to get a quote for a replacement hood and front cover as these have been melted by the heat of the fire. Fortunately the rest of her escaped unscathed. Hi, I am now the owner of a seamaster 8,13. It used to have fixed shaft propeller,with deep keel, or was built for that. My boat have sterndrive and a 130 hp Volvo Penta. I find it very hard to control/steer in vawy waters, heavy seas. I wonder it anyone know if anybody has removed some of the keel, if so does the keel contain any ballast, please anyone???? I have a "Captain" 20ft Seamaster and I am looking for the date of manufacture. The plate I have states it was built in Durham and has a number 1698.
great times on her. We last she her at pyford marine on the river wey. I do I find out the year of construction on my seamaster 27? Where can I obtain replacements? i have the original hand book and how to adjust to get forward and reverse but nothing about a nuetral ??? The tacho on my Seamaster 813 has just failed. The signal comes from a Lucas LRA100 alternator. I have checked to ensure there is 12v at the Gnd & Bat terminals, all Ok! The tacho is a Faria TD9127B. Does anyone know what voltage should be present on the Sig terminal (AC I assume)?? To the owner of WAPLE H (seamaster 23). The original Volvo MD1 in my sailor 23 has given up and needs replacing- which engine will fit the existing engine mounts and prop - will a Yanmar GM10 or Bukh10 or Beta 10 fit? Still looking to buy a boat fancy Seamaster 30 going to view some in New year. Seen 1990 Seamaster 30 special commission it has twin Ford FSD 75hp engines. Cruising speed 6 knots using 6 6 Gal an hour at cruising speed. This seems a lot of fuel other 30's state under 1 gal an hour is this 1gal per hour realistic. I am looking for a template for the windscreen on a seamaster 27. A previous owner has replaced the windscreen with a higher one and also put a solid roof on that is not in keeping with the boat. We are looking to put an original style windscreen back and a new canopy. i am nearing the end (I think) of a Seamaster 27 motor cruiser re-fit. I find the steering 'vague', maybe because I'm used to tiller steering on dinghys. I've been told that i could add an extension to the rudder of about 6 inches and that this would give more feel. Has any other reader done this? What is the Seamaster rudder made from? one is a very lazy starter. I have replaced the injection pump,injectors,heat plugs, make sure there is no air in the system, yet it can still take between 3-5 mins to start even with the help of the other engines batery. Hi I am from Ireland and have just started restoring a Seamaster 25, I need original parts (small orange skylight for cabin ventilation is missing ect. If anyone can point me to stocks of seamaster parts I would appreciate it! Having removed, dismantled and rebuilt gearbox from my 8m I am disappointed to find the noises I was convinced were gear/bearing wear have not gone away. Does anyone have any idea what a rattling that kicks in at about 1200rpm could mean on a Perky 4-107. Difficult to answer as they are such a noisy unit but if anyone knows the audible early warning signs of trouble on these I would be grateful for the info. Tips on the box refurb. to follow. Have been looking at buying boat between �10000-�20000 like the look of Seamaster 30 twin engine. l would like to know our sea worthy they are and were anyone who ownes one has ventured. Any hoody know where I can get replacement? We have a seamaster 27 with a pre crossflow petrol engine and a wortham blake gearbox. The engine is good but the gearbox is dying. I was thinking of changing the lot for a diesel? A ford 1.8? Does anyone know of one...!..? Or will it even fit? There doesn't appear to be much height under the floor. Hi , I have just purchased a Seamaster 30 .I wondered if anyone could point me in the right direction of finding out when she was made and possible previous names etc.The current number shown on the brass plate is 4842.She is currently lying at Wayford on the Norfolk Broads. Hi, I have a seamaster 30 and I need to replace a front window in the wheelhouse. As some of the aluminium profile was damaged I was wondering if anyone knew where I might aquire some spare aluminum to replace damaged pieces. If I could purchase the whole aluminium frame it would be more suitable. ANY HELP PLEASE? I have just bought a seamaster from my brother (who is a Seamaster Club member, as I will soon be)and am already hooked with it being my first boat. It needs quite a bit of work, being an older model and there are a few leaks through the windows etc. to sort out. My question is............. the boat has a huge wooden flat canopy above the rear area, with the windscreen being wooden framed (parts now rotting)and leaking also. I would like to remove this for a nice split framed windscreen and seperate canopy to enjoy the sun when we get it. I have looked throught the net to no avail. Any ideas or suggestions for manufacturers please? I am moored at Yalding in Kent. I have just purchased a Seamaster 23 1972 Number 461 ( Lillian III) Lying at Heybridge Basin. There are external screws into the dashboard, but not sure what else I might be encountering? 2. I need to buy covers for the original fuse boxes, 6/8/6, in order to comply with Boat Safety, any idea where I might purchase these please. 3. It also has some osmosis bubbles, not sure where to start with that one! I need to get a trailer for my Cadet 25' so I can pull her out for work. If anyone can suggest the bilge keel width it would be most helpful. Bought my first Seamaster 30 this season and have already spent considerable time restoring her. Her aft cabin roof and windows were removed. I believe I can get this cabin roof back, but the windows appear to be long gone. Can anyone help me to locate aft cabin windows (4 off), either new or original. I've just acquired a Cub. It once had a cooker of sorts. Probably a two burner hob. I'd like to re-instal one. Anyone got any hints or tips? The petrol engine allows the cockpit floor to be all one level and my concern if I go for the Thornycroft Diesel is the hump factor. Can anyone advise? or preferably does anyone have a Ford Diesel I can drop straight in? My seamaster 23 with a 1500 pre cross flow engine runs and sounds like a dream but always has steam coming out of the exhaust. Replaced or checked every conceivable part but still steams. Doesnt overheat, have run it for 5 hours continuously up to Tewitfield and back the following day without any problems. Anybody else had this issue or know how to solve? Have been told to extend my exhaust downwards so it is under the water and you cnat see the steam , anybody else done this? The exhaust is very short about 4" from engine straight out back of boat, is this normal ? We are in need of a new canopy for our Seamaster 27 c.1970. Has anyone had one fitted recently who can recommend a supplier. Also would you recommend canvas or PVC. Having suffered 9 years of heavy vibes (man!) the port front engine leg/mounting bracket on our Perky has sheered. Anyone know of a supplier / fabricator for this item? I've tried the obvious sources, without success! I think I may have found a supplier for the AV mounting(s) itself (watch this space!). Does any reader know of a company / individual in the Yorkshire region who can supply vinyl or other material headlining for the aft cabin of an 8m. Ours looks really tatty but it is a job that is not quite DIY'able! Please could any one out there help me find a seat frame for the helm of my Seamaster 23 Kingfisher 11? I am trying to restore it to a more original condition and can't find one anywhere. Anyone know where I can get the part that allows you to winch up the prop on a seamaster 23. Hi I have a Seamaster 23 and the complete part/mechanism for winding up the propellor if you get something stuck around it is missing. Does anyone know if you can you still get these or does anyone have one for sale? Need the dimensions for sails to our trusty old Seamaster Sailor 23. Something about "E" and "P" measures I've been told. thanks for taking the time to read my post. my wife and i bought a seamaster 23 last summer and we have had our fair share of teething problems with the wortham blake pre crossflow engine so we decided to rip that one out and refit a crossflow petrol engine which appears to be a lot better( actually looking for a vintage ford mechanic who may be able to tune it for us!!). now we are going to concentrate on the interior a little bit but firstly we were wondering if there is any where to buy the side folding seats from as we only have the one on the steering side. secondly , we want to upgrade the instrument cluster as it is very dated but we were hoping to employ someone to do this as we need all the wiring redoing - does anyone know anybody in yorkshire who might take on a job like this? your help in this would be greatly appreciated. Hi all, we have owned our Seamaster 27 for a few months now and have had a few teething troubles but I think we're getting there. We need a new fuel pump for our Wortham Blake petrol engine. Does anyone know what type we need? just wondering if this boat is familiar to any of your members as have been told she was owned by a prominent member of the club. Has anyone got a picture they could send me of a seamaster mark 1, 1962, 27ft? I'm looking at a Seamaster 813 constructed by Aardvark in 1989. I've never heard of Aardvark and am trying to find out how its quality if construction compares with the original Seamaster version. Can any one help or point me in the right direction to find out? Just read an old message seeking information on this boat. I can supply some. Please let me know if you are still intersted. I have been asked by a friend to see if I can trace the history of the Nantucket 31 he was given last year. It had been partially sunk at her moorings in Langstone Harbour and passed to him when the owner died. There is no documentation with the boat and she doesn't even have a name, although we were able to find out from a previous SSR number that she was once called "Pragmatist" when registered between 1989 and 1994. She also had a set of dodgers onboard with the words "If and When" written on them but we don't know if this was a name that was ever given to her. All he knows is that it is a Nantucket 31 MkII built by Seamaster boats in 1970 and it has a builder's No. of 3524. She is now well on the way to a first class restoration but it wouldn't be complete without being able to put some history together. He doesn't use the web so I volunteered to help out. Does anyone have any suggestions as to how I can trace her history? We'd be very grateful for any suggestions. Hello, Is it possible to tell the age of my newly acquired boat from its manufacturers number ? Please can someone help? i have a 23 Cruiser and am trying to restore it to a more original state and am in need of a helm seat frame , i think it should be side mounted but am unable to find out where to get one from, if anyone has an old one or knows where i could get one it would make such a difference to the restoration, thanks for reading. Hi. I'm wanting a boat for use in the sea but also fancy travelling on canals. Can Seamaster boats be used for both? This might be a silly question but I'm only just starting to find out about boats! Hi Everyone, I have a perkins 4108 diesel engine, when the engine is running the revs will increase by about 200 revs by itself and then drop down again, they keep jumping up and down, has anybody ever had a problem like this and what could be the problem? The Ford X flo 1500 engine fails after 40mins running when throttling back to tick over, changed points, condenser and coil (fitted 2 so I can change over). Water pump is running ok but it seems that the engine is running very hot and possible causing a "vapour lock" as it starts and runs well after a 20 min rest! Plugs seem white as if its running lean, dose any one know what plug should me used on this engine. Can anyone advise the correct prop size for my seamaster 28.
also any good places to purchase a new prop. Thanks for any advice that you can give me. Does anyone know if asbestos was used in the production of the roof and wall linings of the 1980 seamaster 30? I've recently taken part ownership of one of these boats and have been advised that asbestos was used, when I have been leaning the boat I have noticed fibres coming away. If this common in these boats and am I looking at a restoration job? Hi ~ I have a Seamaster 30 (1974) and the original aft cabin hand washbasin in the vanity unit has a crack in it. I want to replace it ~ any ideas where I can purchase one or something similar. Any ideas welcome. Cheers. Have apparently thrown away (don't ask! )the removable engine oil filter bowl with its spring and bolt from my 8 metre's 4-107. Does anybody know from where one of these assemblies can be sourced. Alternatively a 'spin-off' conversion kit if one available for this perky? Love the boat - love the great comments about the boat - most of all love being on the Thames in my own piece of nautical history. Having said that has anyone an idea for a footrest for the two Captains chairs---legs just hang and the cramps soon set in. Contacts for ideas would be very much appreciated, I have considered amputation , but that seems a bit drastic!!! Has anyone done the Ribble Link in a seamaster 23 and was it ok for air draft under the blackpool road bridge? Has anyone taken a seamaster 23 through the Ribble Link. I have applied and filled in the application forms and entered the air draft etc from the club specs for a 23 and they informed I am close to the limit for the Blackpool Road bridge. Just wondered if anyone has done this and had any problems? Has any owner managed to successfully align a single drive prop shaft to engine on an 'eighty'? I have a "flexible!?!" coupling which has no mating faces to give any indication. If this is removed, the flanges connot be brought together due to the propeller contacting the bearing bracket! However. it is obvious that the vertical and horizontal (and possibly angular)alignments are way out! I am looking at a Seamaster 30 this weekend to see if we should buy her. What should I be looking out for? Hi. I have owned Ma�ana IV (Build No 4096, 1973)for nearly 3 years and have her moored on the River Nene in Northampton. I would like to convert the windscreen to fold down for accessing the middel level navigation. Has anyone any plans pictures or other useful information on doing this? I am looking for a Flame Cheater International 4kg automatic fire extinguisher for the engine cavity of a Seamaster 27. Does anyone know where I can get one please? Does anyone know where I can get a P bracket for a seamster 27? I've just snapped mine. I need to replace my Seamaster 27 sea toilet and fit a holding tank. Where is the best place to fit one and what size is required or where is the tank on your 27 fitted. I AM LOOKING FOR SEAMASTER 23 IN USABLE CONDITION WITH A BSC, DIESEL OR PETROL MUST HAVE GOOD ENGINE & LEG. MY MOORING IS ON THE AVON. BOATS IN THE WESTMIDLANDS AREA ISH.CASH WAITING. We're seling, Ariel, our Semaster Sailer 23. We need to seel her urgently so we don't miss out on a bigger boat that we have seen. So she is onsale for offers over �2,500. (She has been up for sale for �5,0000 for the last year whilewe sailed her!) If you are interested call Ravi on 0775-390-3073. The full details are on eBay. I am currently looking to buy a Seamaster 25, but am unsure despite the name as to how well they, and indeed the Seamaster range perform at sea? I would also like to know if I would need any special licence or qualification before I took a boat to sea? I have a half share for sale on behalf of my sailing partner's widow. We like to race at Mylor on Friday evenings. But I really need someone to share the delights of cruising my boat with. I have Coastal Skipper qualification and can be flexible with timing - weekends or holidays. We have some beautiful sailing waters here in Falmouth. Anyone know where I can get replacement wooden trims for a seamaster 23. Took them off to revarnish and clean and repaint deck but a couple where rotted and need replacing. I was really interested in reading the article from Brian foster regarding reducing fuel consumption on Trampus. When I was young (1979ish) my father was toying with the idea of changing our boat as she was wood construction and needed a lot of attention, a fibreglass boat seemed the ideal solution and he saw Trampus for sale in hest bank. We went to view her and we all fell in love with her straight away, unfortunately finances didn't work out and we didn't buy her, but we all have a soft spot for Trampus and every time I see her I think she is the nicest 27 on the cut. It may be my rose tinted specs, but she has a certain presence about her and its a treat to see her still going strong. Hopefully we will see Brian out and about this year. My SeaMaster 8 metre has the serial number 3702, can anyone tell me how I can date her and is there any way of finding her history? If anyone is travelling on the Lancaster canal from Cabus between bridge 72 and 73 as far as Bridghouse Marina and could give me a tow it would be most appreciated. Its abour 2 1/4 miles. Can anyone help please, I am looking to make my own canopy frame and would appreciate if anyone could help me with measurements of the frame and fixings, a couple of photos would be great as well. I have a seamaster 30 I am planning to take the overhang on the back window off to give it a reseal, has anybody ever done this before, if so do you have any advice as to what I am up against. I have removed the front window of my Seamaster 8metre and thought I'd share with you the process. The fact is that this is a relatively easy job and anyone that can operate a screwdriver will be able to do it. First remove all the external screws from the frame. Score around the frame with a stanley knife or other sharp blade. Gently pull the whole frame from the boat, gently prising with a screwdriver if necessary. A second person to steady the window is a help in case the thing comes out too quickly. Stand the window frame on the floor and remove the 8 screws from the top of the frame. These can be a pain if they're rusted in place but WD40 helps, be careful with these as they make a bid for freedom and are extremely small and difficult to find if they drop. Then slide the glass to the middle of the frame and lift out. I have taken a Seamaster 815 for a trial sail in not very strong winds and was surprised at how much weather helm there was. It may be that the mainsheet traveller/mainsheet were not properly adjusted. Is weather helm a problem on the 815? Otherwise the boat was very good. Your comments please. Does anyone know of anywhere that can supply parts for a 1973 teleflex engine control lever? Namely my grey neutral push switch has seen better days and needs replacing but I'd rather keep the original than change the whole lot over. hi all i have just purchased a 25foot seamaster with a perkins 4-107 in poor shape. the stern drive had been taken off, this is a transa drive and i cant find any information on this any where. HELP two things firstly where can i buy a bellows for this drive approx 950mm diameter both ends and second how does this leg lock in to position when put in to reverse any help would be appreciate. A little advice please about charging the boats batteries. I have just bought my first Seamaster, a 30 fitted with twin Thorneycroft engines. She's fitted with twin battery banks and separate split charging systems. I would like to be able to charge / condition the two banks, but would like to hear from forum members as to their experience and preference as to what charger to purchase. My thanks, Mike. Hi, have a 23ft seasmaster with lifting keel. On the water (river/mud) Keel is a little sticky. It is working and I can wind it in the up position, but not dropping under its own weight, needs persuading. Any help, don't want to take it out of water before I have one sail in her. Is it case that the mud isn't helping. Appreciate any ideas. I have started a blog with regard to the rebuild of our SeaMaster 8m. Anyone who is interested in seeing the progress so far please feel free to have a look and leave any comments if you wish. Does anyone know the overall width across the bilge keels of the Seamaster 23S. I have just bought my boat and I am getting a yard trolley modified to accommodate it, but unfortunately failed to note this vital measurement before the boat was put into the water. Subject: 8m window replacement help please! I'm new to the site and also the club and would like some help please regarding the seamaster 8m windows. The starboard side front window (namely bathroom window) looks like the opening handle has been over tightened and has cracked the glass and altough is not leaking it really needs replacing. Could anyone point me in the right direction as to how this comes out? It looks like the whole frame needs to come off the boat, not too bad as the bathroom is in the process of being refurbed so is easily accessible from the inside. Am I on the right track or can the window glass come out with just the outer frame removed? Subject: Need help Tracing a Particular Seamaster 27... 'Glyn Rich'? Hi, I wonder if anyone could help me track down my Grandfathers old boat? All I know is that it was a Seamaster 27 called 'Glyn Rich'. I believe he sold it around 1990 before he sadly passed away but I would like to hear if anyone has any information about it's whereabouts as I'd love to get it back in the family as I spent many a weekend with him on it as a young child. He kept it at both Benson and Harleyford on the Thames and if anyone could help me track it down it would be very much appreciated. I've just purchased a Seamamster 30 and need to sort out some of the wiring. The boat came with a few photocopies of the original blueprint which are very indistinct. Can anyone tell me how I can get a reasonable copy please. The diagram is marked 165-16, Seamaster 30 standard wiring diagram. I have a separate copy of the Thorneycroft engine charging circuits from this website which is a great help. My thanks in advance, Mike. My base valve gasket on my toilet is broken,the gasket sits at the bottom of the pump cylinder and may have a metal flap or a hard rubber piece in the middle so when you pump the handle of the toilet it moves up and down, The problem is,it is not a Jabsco part, and I dont know what make it is, If anybody has had to replace the gasket on there toilet and can tell me the name of other brands I would be greatful. I have just brought an old Seamaster 21 in need of some serious restoration. As I need to buy a trailer to pick it up, I was wondering if anybody could tell me the approximate weight, so that I buy one that is up to the job? Also, it has a makers serial number of 1065 - is there a way to date the boat from this? I look forward to potentially joining the club as soon as I get her home, as I'm sure it will be worthwhile. Hi everyone, my Base Valve Gasket on my toilet needs to be replaced, this is the gasket at the bottom of the pump cylinder that has the piece of metal in the middle and it flaps up and down when you pump the toilet.Very easy to get if you need a Jabco valve, but my one is not a Jabco hence the problem. The one I need is bigger than the Jabco valve, if anybody knows the make of it I would be very great full to here from you. After my earlier appeal, we had a note from Mike and Chris (Wild Rose Seamaster 23), to say that they had seen Cellini recently. She was spotted going through Brownshill Staunch Lock on the Great Ouse. This was exciting news for us. We owned Cellini in the early 1990's and had many happy memories of cruising the Thames. We often wondered what became of Cellini and whether she was still 'going strong', Thanks to Mike and Chris this question has now been answered, but it would be interesting to know how and when Cellini was moved from the Thames to the Great Ouse. Perhaps her present owners would like to 'fill us in'. This is for interest only. Thank you. Im looking for a raw water pump 2.52 diesel flange mounted (thornycroft diesel engines) for my Seamaster 30 ~ can anyone point me in direction of reasonably priced one or dismantled one in good condition. Is anyone aware of a boarding ladder which is suitable for a Seamaster 813? Also, our 813 is "open plan" with a sea toilet directly behind the helm. Is this a similar arrangement to yours? Do you have any reference to the makers? Can anyone suggest a suitable boarding ladder for an 813. Whilst we are on the size of props and to save me time and dosh,I have fitted a Volvo Penta AQD 21A (75bhp) with an Aquamatic 280 leg, the propeller it came with was a 15 x17L propeller again as in the previous post not really happy with its running Has anybody else got the same setup and what propeller are you using ? I`m trying to restore our Sea master 27 canopy & frame. The original frame, windscreen and canopy where removed by a previous owner. Can anyone with a 27 measure the height of the windscreen and canopy frame and post the measurements please, I would really appreciate your time and effort with this request. Can anyone tell me the height of the of the windscreen on a Seamaster 27. I have a Seamaster 23 with a 3 cylinder Isuze engine and Enfield outdrive. I have come accross a Seamaster 23 for sale and I am now trying to find out a little about Seamaster boats. very pleased to find this site which is full of helpful and friendly information. I have read most of the comments but I do not seem to have seen any ref to a single keel Seamaster 23, which the boat I am looking at has. It is in need of some work which suits me as I was looking for a bit of a project. I notice some refer to a serial number, could anyone also advise me where I would find this. (It does have SSR15382 on the side of the cabin, but I am not sure if this is any help. hi, we have a seamaster 30 which we have been restoring for a year now and have just realised that we dont have the removable dinning table! Whilst my Seamaster 27 is in dry dock for maintenance, I have a mooring available to Seamaster Club Members should they so wish to spend some time on the River Wissey. Please contact 07828 732710 for more information. Put in engine oil as told right oil but box did not like it.Started to make a squaling noise. Anybody with perkins 4108 with prm box what oil do you use? Many thanks if you can help me out. I've taken an interest in a Seamaster 23, lifting keel, pocket crusier. Before I take matters further, could anyone suggest a suitable surveyor? The boat is on a hard standing in South Wales. Thanks very much. I am in search of a deck porthole for my sailing boat a sea master 815 (26' 9")? Can you help me ? Hi all, as you may be aware by now, I own a Seamaster 27, a really nice boat, with a Ford 1600 diesel engine, and a Wortham Blake Hi-Drive 400 gearbox. I have now decided, if at all possible of course, to change the gearbox. The problem is, my existing gearbox has an offset 2-1 reduction on it, and therefore to change the gearbox will be very difficult . Has anyone any idea how to do this, and if not, what have you got on your 27's , ie, engine gearbox combinations. Any suggestions or advice will be gratefully received. Would anyone out there have for sale the above gearbox. I'd be happy to pay a fair price for a fair 'box. Can anybody advise me on the thermostat temperature and pressure cap ratings suitable for my 2.5ltr Thornycroft 154's. Ive been advised by ASAP that they will probably be 10 psi as there is a calorifier fitted. We have purchased a Seamaster 27 but there seems to be conflicting views on the age of the boat. Seamaster plaque No. is 2760. Any way of finding out when it was actually built? Hi guys n gals has any body got a full canopie for a 27 my boat had a hard top Im getting back to basics if you have the gear for sale Im interested email or call me 086 6869135. larry. Hi. I have just bought a Seamaster Cub 17 for what I hope will be a relatively easy first renovation project. I have noticed the centre board/keel looks fairly rotten. What is the best way of getting this sorted? Any recommendations for assistance in the West Byfleet area? Due to water ingress we are looking to replace the covers on our boat cushions. My questions are can you use fabric used in furniture manufacture or does it have to be a marine fabric. If it has to be marine fabric does anyone know of a supplier of the material. We are considering putting a shower on our SM23 "CARAVEL" Has anyone done this? if you have is there any chance we can come and take a peek? I have a perkings 4.108 diesel engine, I use 15W40 engine oil and so far no problems. I have heard that I may be able to use 10W40 engine oil, will it be ok in this old engine?. I have a Seamaster 813 Owned by us since 1978 approx. NEVER has this boat been in the water!! It is still an eary DIY project. I was just wondering If this might be of interest to anyone? I have just completed a refit on a 1960's aft cockpit 27 and she is looking great and ready to go BUT I need a new or second hand prop as the original is beyond refurbishment. We are new owners of Evermore Seamaster 813 (HIN 4831) boat registration G5664. We are trying to trace the history of this boat, does anyone recognise these details. We understand the boat may have previously been known as C Dawn! Where can I find the CE classification for my Seamaster 815? I also live in Kent (BR7) & am on the lookout to purchase a motor cruiser. I could be interested in your idea of sharing your boat. Can I have a land-line no to call you & discuss further? I have recently purchesed a Seamaster 17 cub that needs a lot of work. I have repaired the fibre glass and the boat is all sanded down ready for painting in the next few days. My issue is with the engine, it has no dials or clock and I dont know what engine it is. I dont know how I am to wire it up, it is an inboard engine of about 1litre looking at the size. I am not oppose to replacing the engine if anyone has ideas or information on which engines are suitable and would fit straight onto the current gearbox. I want to relace the seperate sink and drainer in my 27 with the same style as the current ones have seen better days. Does anyone know where to sourse these? I am looking at the possibility of adding an holding tank to my 813 and would appreciate other members ideas and experience if they have successfully done a similar job. hi all i just taken ownership of my first seamaster 28.6 commondore (minerva) which the pictures of her are on the site i got her in a state she had not been touched since 2006 so bit of a mess i have 2 problems one is when it rains and boat is not sitting level the water runs off the roof and in to wheel house how can this be solved and also one engine really smokes to much diesel (white) and sounds like its miss firing could this be the injectors at fault ?? Subject: Seamaster 30 50% share. We have a Seamaster 30 moored on the Southern Norfolk Broads. We just love the boat (our third 30) and the Broads. However, we live in Kent and do not use the boat as often as we should. This is a shame and I wonder whether any Seamaster lover out there would consider buying a half share in the boat and getting possibly 70% use of her every year. Would be interested in having a general chat with interested parties to discuss the proposition. Alan. has anyone any info on a keel cooler or fitted one to a seamaster 27 as I would like to convert mine from raw water and do away with the weed problem. further to my previous posting, i realise that i did not put enough information. the engine is a volvo pente AQ D 21A which is listed as being 2110cc 4 cylinder diesel, 75hp, engine number 3116941. it is fitted in what i belive to be a Seamaster Cadet, but i am not 100% sure of the exact model but it is a Seamaster. I am after a wet exhaust manifold For a thorycroft 154 2.52 ltr engine approx year 1972 I beleave the original part number was 5499903 for the full assy. I am still into a major refit with my seamaster 23 and have lost a hand rail stanchion and cannot put the handrail on and consequently cant put head lining up which will go up before the woodwork which has been removed and varnished can be refitted, anyone got one or does anybody know where I can buy one from ? Hope someone can help thanks for reading. I have a Seamaster 27 with a 1600 ohv petrol Wortham Blake engine without a thermostat , recentley I had to change the water cooled exhaust manifold as it had split.The new replacement originally for a Watermota engine has slightly different water connections. This means that the water deperature is about 30-40 degrees c instead of the 60 degrees c it should be. Has anyone any idea how to resolve this or even where I can obtain the correct thermostat as I have been told you cannot use a car one,thanks. Hi all need some advice. We have recently purchased a seamaster 27 with a Wortham Blake petrol engine. The engine was running fine although it had cut out on us. When we tried restarting the engine it turned very slowly and would not start. We fully charged both battery`s checked all the connections were clean and tight. Still the same, engine turns very slowly starter motor makes a scraping noise or when you turn the key there is just a click.The starter motor case gets very hot and I am not sure if it has had it or not. Any advice would be greatly appreciated,thanks Aubrey. Hi There, I am in the process of acquiring a Seamster 27. The gas water heater is broken and I am intendng to fit a calorifier tank, can anybody help me with the best places to take the feed and return off/to the engine. She has a Perkins 4107 with bilge cooling. i have a seamaster fitted with a 2.2 volvo penta diesel engine. i have to replace the starter motor, as it was stolen, but do not know any details about it. i have looked on volvo's web site but cant find any info as they do not seem to list anything for older ( pre 1970 ) engines. can anyone help please. i need to know where i can get one and which type it is. thank you. I am very interested in purchasing a Seamaster 27 (Think its pre 1970) with Ford pre crossflow engines, probably 1600cc from Ford Consul/Thames Van. My concern is the age of these engines, are spares readily available are they reliable. Please would somebody give me their views. Also as they are petrol what your thoughts on changing to diesel? I am contemplating a S27. Concerned about the lack of space for young feet when walking to the bow. Anyone widened the beam by fitting a 2/3in wide length of wood/ or whatever shaped to fit over/replace the existing length? Should fit in quite well with the general appearance! Is there a mod on the market for this? I was wondering if anyone has had any engine work done by Russell Marine in South Walsham Norfolk. Can anyone recomend them or give some pointers as how to avoid problems later on. Been searching for a user manual for the Wortham Blake series 400 Hy-Drive gearbox,fitted to my 27, to no avail. Has anyone out there, a copy I could either borrow, copy, or buy. Any help would be gratefully received. We had the same problem with our 1974 seamaster 23, our windows to rattled, we solved this problem, as taking the windows out would have been a nightmare as you pointed out. I am trying to find out how old my recently acquired seamaster 27 is. She is registered as Elisabeth 111 and she has a Ford pre-crossflow engine. This is a message for Dave Gray. I read the thread that Clive started, when his engine 'died'. It seems Clive has sorted his problem out, now. I saw that you had a Perkins 4.108, which you offered as a possible solution to his problem. My brother and I share an Admiral, based at Shepperton, on the Thames. Presently, it has a 4.99 which is nearly worn out. I'm keen to buy another Perkins engine that we can just drop into place. Following a recent disaster when our starboard engine cracked up on a return trip from the Thames estuary ,I contacted Jane Wall for copies of two manuals , Within 4 days ! I received copies of these manuals . I wish to publicly thank Jane and the Seamaster club for such a speedy response. We can now set on the course of Renown`s recovery.Our boats HIN No is 4585 does anybody know any history for her ? I have a 1969 Seamaster 23 that was acquired earlier this year. When running, there is a considerable rattle from the sliding windows vibrating in their tracks. On inspection, the seals have perished away to nothing and it's now just aluminium window frame clattering away against the tracks. From this forum, I identified the replacement window seals from seals direct and ordered them. I now have them and am faced with a new problem; How do I remove the sliding windows from the boat in order to fit the seals? There doesn't seem to be a straightforward way of doing this and it seems that the only way to free the tracks would be to unscrew the aluminium frame that runs the length of all the windows. I understand that this also holds roof up so it's not something I wish to start if there's an easier way. Can anyone recommend the best way to remove the sliding windows so that the new seals can be fitted? Hi, I am wondering if anyone can help. If I leave the helm even for the shortest time, and the boat begins to go off course, whether we are under sail or power there seems to be a viscious pull of the rudder to go further off course. ie: there is no self straightening effect whatsoever. Yes the rudder is hung at an angle from the transom, so that when turned, a small part of the leading edge of the rudder actually lines up with the wrong side of the keel line, but surely the biggest part of the rudder should be pushed to the centreline by the force of the way of the boat. We normally carry rather a lot of weather helm which I can't seem to correct, but we want to try and get her to be less tiring to steer. Looks like I need a new set of sails, my 23 is fitted with a roller boom and furling genoa, does anyone have any info on the sail dimensions? Hi, I've just bought a seamaster 20 which I believe should weigh about 1 ton, but my trailer (which should take it) won't. The inboard engine has long gone and I'm going to strip out the cabin furniture - does anyone have any suggestions - would there be ballast in the boat and if so where? Any help gratefully received.